We have created an interface Order which is acting as a command. We have created a Stock class which acts as a request. We have concrete command classes BuyStock and SellStock implementing Order interface which will do actual command processing. A class Broker is created which acts as an invoker object. It can take and place orders. Broker object uses command pattern to identify which object will execute which command based on the type of command. 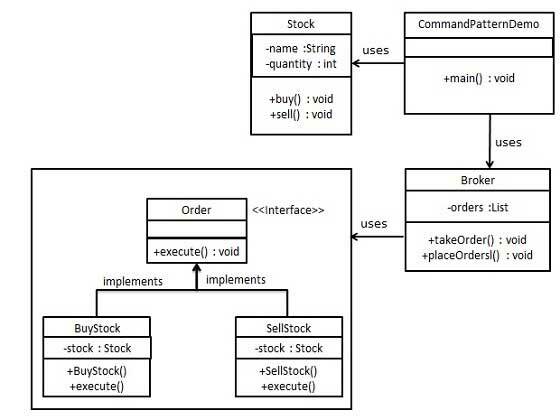 CommandPatternDemo, our demo class, will use Broker class to demonstrate command pattern. Create concrete classes implementing the Order interface. Use the Broker class to take and execute commands.